Verizon's high-speed 4G long-term evolution network, which the company's CEO has publicly said Apple is interested in, will debut this weekend, bringing 10 times faster download speeds to USB modems this year, and smartphones in 2011. Verizon announced that it will launch the world's first large-scale 4G LTE network this Sunday, Dec. 5 in 38 metropolitan areas and more than 60 commercial airports across the U.S. Data plans will run $50 for 5GB per month, or $80 for 10GB. 4G LTE mobile broadband offers speeds up to 10 times faster than Verizon's current 3G network. The carrier has said it expects real-world data rates of between 5 and 12 megabits per second downstream, and 2 to 5 Mbps up. "Beginning Sunday, Verizon Wireless is making the best network even better," said Dan Mead, president and chief executive officer of Verizon Wireless. "Our initial 4G LTE launch gives customers access to the fastest and most advanced mobile network in America and immediately reaches more than one-third of all Americans, right where they live. "That's just the start. 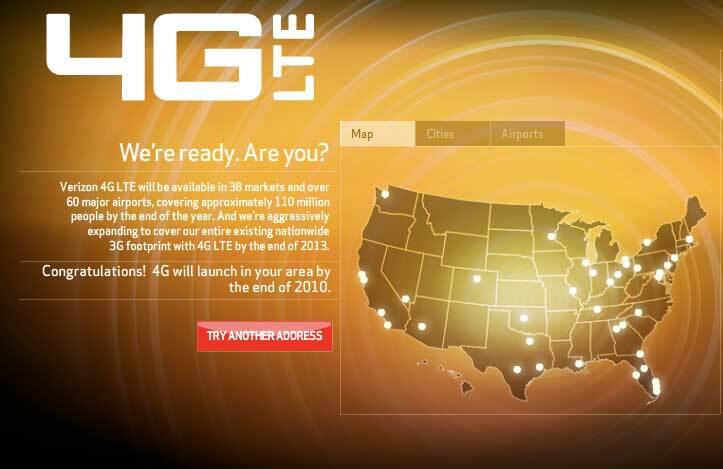 We will quickly expand 4G LTE, and by 2013 will reach the existing Verizon Wireless 3G coverage area." Access to the 4G network will be limited at launch to two USB modems. Verizon has said that smartphones with access to the 4G network will be introduced next year. While the initial launch is limited to 38 markets and 60 major airports, covering 110 million people, Verizon has said that its 4G network will be nationwide by 2013. "We are building our 4G LTE network with the same commitment to performance and reliability for which we have long been recognized," Mead said. "Our commitment to superior network performance, combined with broad 4G coverage areas and the strong value of our data plans make 4G LTE Mobile Broadband the best choice for laptop users." Verizon's 4G network could play a major role in the future of the iPhone. Currently the iPhone is exclusive to rival carrier AT&T in the U.S., but numerous mainstream media outlets have indicated that the iPhone will debut on the Verizon network in early 2011. In an interview last month, Verizon Chief Executive Ivan Seidenberg said his company's 4G network has attracted the attention of Apple. Talks between the two companies regarding the 4G network eventually led to the iPad being sold through Verizon, bundled with a MiFi mobile hotspot. He did not, however, indicate whether the iPhone is coming to Verizon. While Verizon has wider 3G coverage than AT&T, its bandwidth speeds are slower than the exclusive carrier of the iPhone in the U.S. A recent third-party test found that AT&T's network is 20 to 60 percent faster than its competitors.